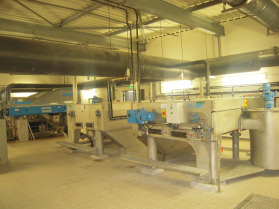 There are two available filter belt types (Superpress LP and HP) available for use with the major sludge groups (organic, mineral...) that will withstand more or less pressure. Another version of these same filters that incorporates pre-thickening using GDE or GDD, is available, and a simplified version, the GD Press, is use for small plants. 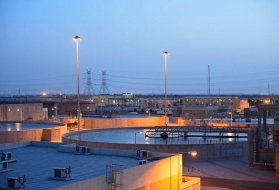 According to the objective set and to the quality of the sludge to be dewatered, several filters are available. This version is suitable for dewatering sludge produced by WWTP and by agri-food industries that does not usually withstand high pressures. Figure 26 provides a schematic diagram of the Superpress principle in its basic version without GDE or GDD. 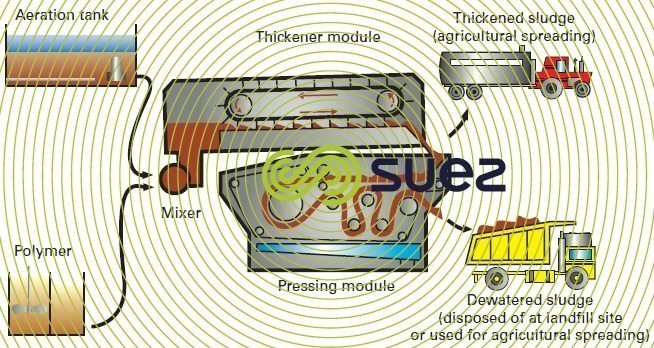 The sludge and the flocculant are fed into a mixer (a) fiited with a variable speed stirrer. The flocculated sludge is flowed onto a filtering belt in the drainage roller (b).The sludge is evenly distributed over the entire width of the filter. and, above all, to carry out first-stage sludge compacting in order to reduce lateral squeezing out at the start of the pressing zone. The sludge is then sandwiched between the lower belt (d) and the upper belt (e), undergoing a first moderate pressing round a large diameter perforated drum (f).Both belts are continuously driven and then pass between a series of decreasing diameter return rollers (g) that apply a gradually increasing pressure to the sludge. The number of windings is selected so that dewatering is virtually completed before the sludge reaches the final roller. At the outlet, both belts separate after the drive roller (h). The cake is removed by two scrapers blades for discharge by a conveyor belt, transfer screw or force-feed pump. 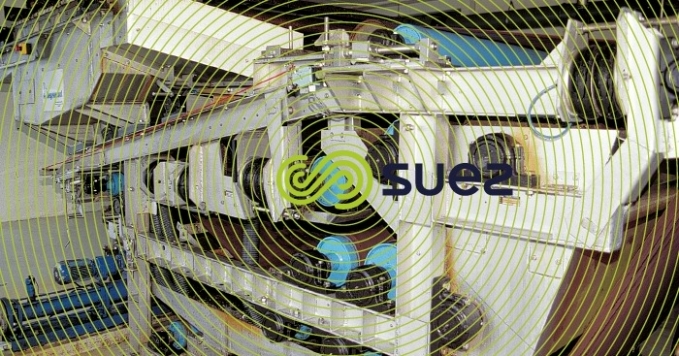 A pneumatically controlled, angular travel roller automatically centres each of the belts. Both (large mesh) belts are washed continuously by pressurised water (4-6 bar) sprayers within closed compartments (i). 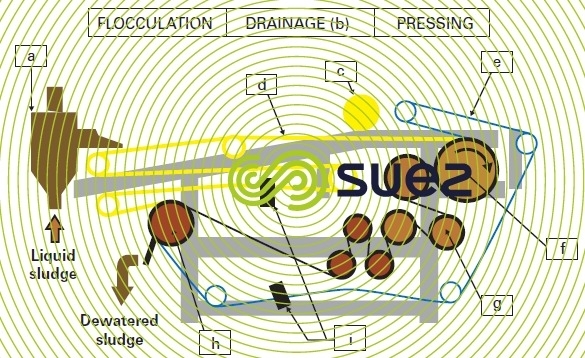 sludge layer depth can be adjusted at the pressing zone feed. potential belt widths ranging from 1 to 3 m.
integral enclosures (photos 19 and 20). This version differs from the preceding version through the higher pressure applied to the sludge. Therefore, the overall design has been adjusted accordingly (especially the reinforced frame); this version has also been designed for processing aggressive sludge (reinforced anti-corrosion treatment). 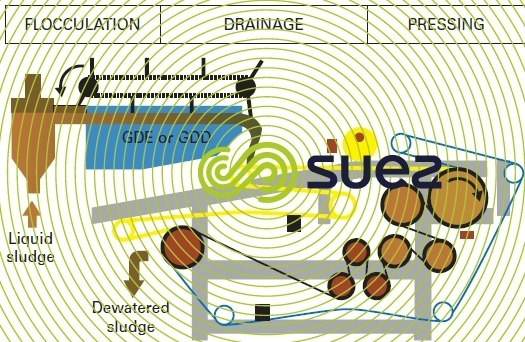 By incorporating a GDD or a GDE (see dynamic thickening) onto a Superpress, high dry solids contents is obtained at the inlet of the dewatering module, irrespective of sludge dilution (> 2 g DS · L–1), thus very noticeably increasing the throughput treated without compromising the mass flow rate. Table 13 illustrates the benefits of incorporating additional pre-draining, by GDE or by GDD, upstream from the Superpress drainage zone. 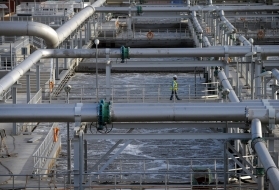 in either case, a mechanism allows sludge to be removed direct from the pre-drainage outlet (for periodic thickened sludge spreading for instance). 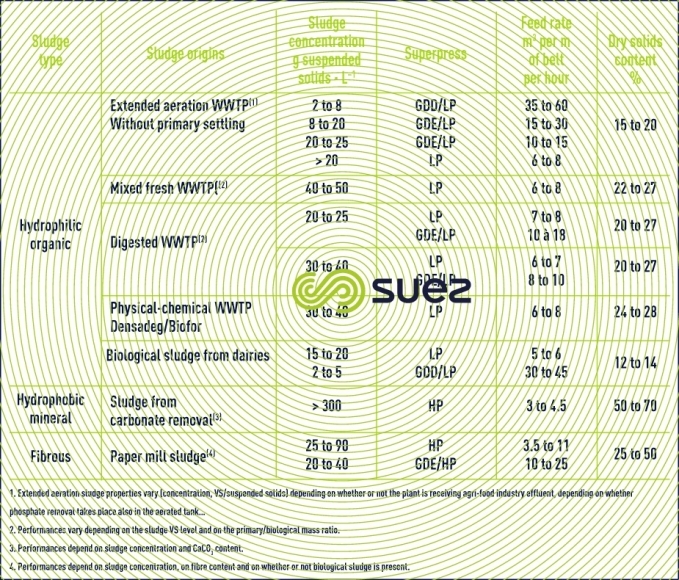 Table 15 provides approximate performance magnitudes for the different Superpresses used with various sludge. This is a compact unit comprising a thickening module (GDE or GDD) and a simplified perforated drum + only five-roller pressing module (figure 28) only. These robust machines are wholly constructed of stainless steel and require very little operating and/or maintenance time. In particular, as is the case with all Superpress filters, they can be programmed to shut down (or for remote starting) without any need for supervision. 908D and 912D type machines can therefore be fed direct from aeration tanks, thus making a sludge storage tank or thickener superfluous.